I tell my story a lot. Pretty much every chance I get to everyone I meet. I think it’s important to do because not very many people have lost 200 pounds and even fewer people have done it with just lifestyle change instead of bariatric surgery or some other crazy method. As I talk to people about the things that they have tried in order to lose weight, I am amazed at the number of crazy things people are willing to do to drop a few pounds. Replace a meal a day with a shake? No problem. Juice everything instead of eating solid food? Done and done. Take a strange pill or liquid drops? Even if they have absolutely no idea what is in the pill or drops or how they will affect their body and long term health? Sign me up! The people I talk to who are willing to essentially play Russian Roulette with their health in order to get to the next dress or belt size down absolutely floors me. But guess what these same people say when I tell them that losing weight is as simple as cutting out the sugars and grains and upping their healthy fats. I could never do that! You want me to go without bread? Pasta? Cake? Cookies? Have you lost your mind? And believe me, I am not talking about a few outliers. I hear “I could never do that” at least 4 or 5 times a week. Even people who knew me when I was 400 lbs and have seen the weight melt off me and have a bunch of weight to lose themselves. Even people who have A1C’s creeping north of 8 or higher that are already feeling that tingling sensation in their feet that comes before full blown Diabetic Neuropathy and amputation. It’s just a basic, gut-level response to an unthinkable scenario. 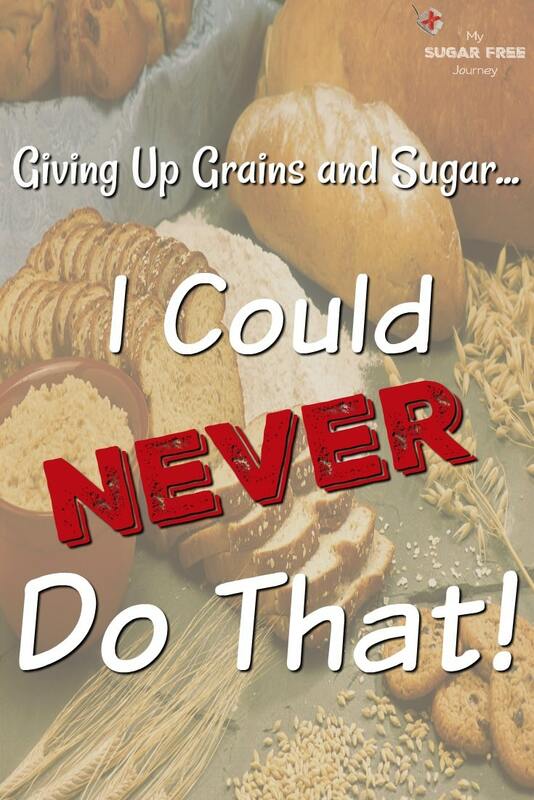 People would rather drink their meals or fill their body with chemicals or even (shudder) have surgery to lose weight but giving up bread and sugar is absolutely off the table. 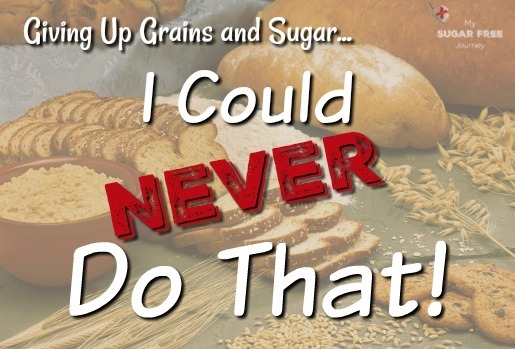 To understand, we need to look at the hold sugars and grains have on us. We know that when we eat sugar, opioids and dopamine are released by the body. Dopamine is key part of the “reward circuit” we have in our brains. Whenever we do something pleasurable, like eat sugar, dopamine is released which triggers a feeling of happiness or well-being. If that sensation is strong enough, we are driven to do it again and again. Do it enough times and we start to find that we can’t be happy without it. In fact we start to seek out that thing that gives us pleasure, even if it harms us in the long run. Grains are an even more insidious monster. Grains have not only thrived but taken over huge swaths of land for their cultivation that could be used for far more productive means of food production. How? By providing the same biochemical high as sugar but being versatile enough to be used as a staple. Sugar is added to everything but no one is eating sugar sandwiches, not so with grains. I Could Never Give Up Bread! So in a way, I can understand this strong reaction. 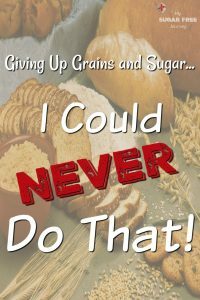 When I ask someone to give up sugar and grains, I’m not asking them to give up one among many foods. I am asking them to give up precisely the ones that give them a hit of dopamine and makes them feel good. I am essentially asking them to give up happiness, or at least that’s the way their brain is interpreting what I am saying. It’s just like asking the addict to give up their drug of choice, it’s a big ask if they aren’t ready for a change. So what do you do then? If you are over weight, have Type 2 Diabetes like my wife did, have Metabolic Syndrome like I did, or some other chronic disease like high blood pressure, high triglycerides or whatever, what do you do? Well, you are at a crossroads and it’s time to make a decision. Are you going to be the addict who helplessly continues taking their drug of choice even as it kills them or do you make a change? If you are ready to take the first step in kicking your addiction, I can help! Join our 28 Day Ketogenic Weight Loss Challenge by clicking here. You will get weekly meal plans as well as access to our awesome support group with over a thousand people losing weight on the ketogenic diet. You will also get nightly training videos designed to educate and inspire you. Click here to join today! NEXT POST Next post: The My Sugar Free Journey Podcast – Episode 49: Mihaela Telecan, The Low Carb RD!